One problem that I had recently has been thinning hair. I think I’ve had hair fall issues my entire life. It was not a big deal back them because my hair was thick and whatever amount of hair fall I had didn’t affect how much hair I had on my head. I don’t know the reason for the hair fall but the thinning hair could either be one or all these things: my thyroid condition, old age (yes, 41 is old for me) or the fact that I often color my hair. I only realized that my hair was thinning out when my sister colored my hair. She commented that I didn’t seem to have as much hair as I used to. I always wear my hair up in a ponytail or in a bun so I never really paid much attention to it, but I became very self-conscious about it when my sister brought it up. There aren’t any bald spots or anything like that, but when I let my hair down I did see that it wasn’t what it used to be. Maybe it is just natural for my age to not have the thick hair that I used to have when I was younger. Maybe it’s just a phase. I don’t know, I never consulted a doctor about it. But like any person who lives in this day and age, I googled it. I went online to look not for reasons but for solutions to my problem. I’ve discovered a fair share of pricey scalp treatments, serums, creams, shampoos and vitamins that are supposed to help with hair fall and thinning hair. There are a lot to choose from, but most of them do not have real-person assurance/experience that this or that product will work. Eventually, I tried to look for more natural solutions. I found that Aloe Vera is good for hair growth. That made me think back to the days when I used to watch my grandmother meticulously use Gugo as her shampoo and Aloe Vera as her conditioner. Her hair, until her last breath, was long and beautiful. I figured if my grandmother could have great hair at her age with Aloe Vera, it could work for me. Honestly though, I don’t know the first thing about where to find or how to use the Aloe Vera plant for my hair, so I decided on the next best thing: I went looking for hair products with Aloe Vera. I searched online and found good reviews for AloeDerma products. I found the products at Watsons: shampoo, conditioner, hair tonic. Both the shampoo and conditioner are sold for P259.00 while the tonic is sold at P249.00 on Watsons’ store in Lazada. I’ve tried all three products at the same time to see if I can maximize the effectiveness of the Aloe Vera. My hair felt good, but the smell of the Aloe Vera was a bit much for me. I decided to pare it down to just shampoo one time, shampoo and conditioner the next, shampoo and tonic for another time, simply tonic or conditioner for one day and so on and so forth. Basically, I mix things up and don’t use everything all at the same time. Sometimes I’d use one or two at the same time but never all three. After a few months, my sister colored my hair again and this time, she told me that my hair felt thicker! Take note that she did not even know that I was trying these AloeDerma products when she said that. Suffice to say, I am very happy with my purchase because it did help me with my hair problem. 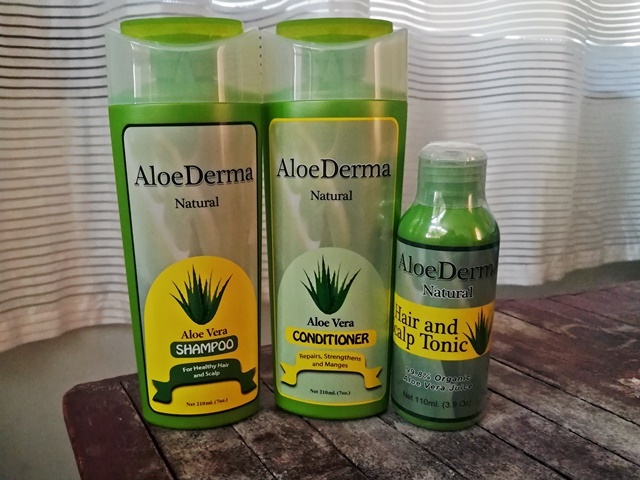 I don’t use the products all the time (like I said, the Aloe Vera smell can sometimes be overwhelming) but when I feel like I’m having a little more hair fall than usual, I make sure to use some AloeDerma for a week or so just to be sure. If you have thinning hair or hair fall problems like me, I suggest you give this a try. It’s not that expensive and is very effective. If you can tolerate the smell, it is definitely worth the buy.